Most wastewater treatment plants treat the settled sewage liquor aerobically, that is, in the presence of dissolved oxygen. The activated sludge system relies on a mixed culture of bacteria to carry out the basic oxidation of organic materials. The main biological groups are bac teria, fungi, protozoans, and rotifers. Major biological groups, with some examples of genus and species, and their functions in various wastewater treatment processes are listed in Table 5. Data from Gray NF (2004) Biology of Wastewater Treatment. London: Imperial College Press; Painter HA (1971) Chemical, physical and biological characteristics of wastes and waste effluents. In: Ciaccio LL (ed.) Waterand Water Pollution Handbook, vol. I, pp. 329 363. New York: Marcel Dekker; Painter HA (1983) Metabolism and physiology of aerobic bacteria and fungi. In: Curds CR and Hawkes HA (eds.) Ecological Aspects of Used Water Treatment, vol. 2, pp. 11 75. London: Academic; Rickert DA and Hunter JD (1971) General nature of soluble and particulate organics in sewage and secondary effluent. Water Research 5: 421 436.
wide range of heterotrophic microbes including bacteria, fungi, and algae. Cyanobacteria are able to reduce nitro gen and carbon simultaneously in aerobic conditions. 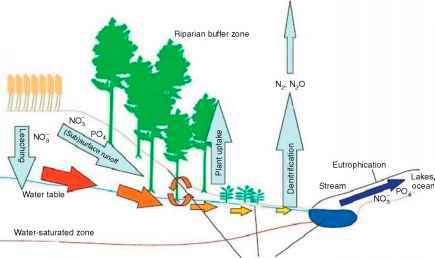 Autotrophic microbes are responsible for nitrification and denitrification. They can be further divided into autotrophic ammonia oxidizers and autotrophic nitrite oxidizers. The heterotrophic bacterium Thiosphaerapanto tropha is able to nitrify and denitrify simultaneously. The phosphorus removal mechanisms is covered in the next section.